Sapa is one of the most scenic regions in Vietnam. It’s famous around the world for its ancient yellow, and green rice terraces carved out of the mountain by the ethnic minorities. It’s a destination I’ve wanted to visit since I started travelling and unexpectedly got the chance to cross it off my list in March 2018. While in Borneo, Malaysia, I discovered that South Africans could get a visa on arrival at the airport if you apply online beforehand. I quickly abandoned my plans to go to the Philippines and booked my flights within the next day. 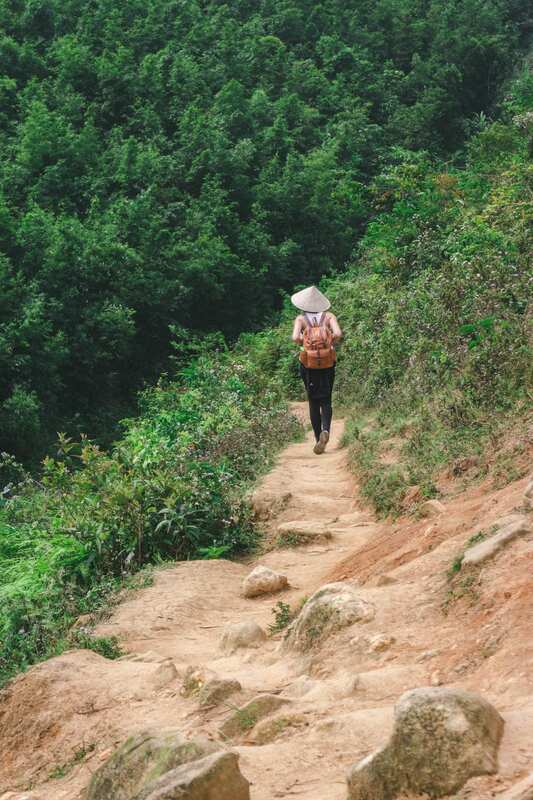 I had zero plans when I arrived in Ho Chi Minh, but I knew the thing I wanted to do the most was trekking in Sapa. After doing some research and paying my Sapa trekking tour deposit, I started my 2-week trip from the south to the north of Vietnam. 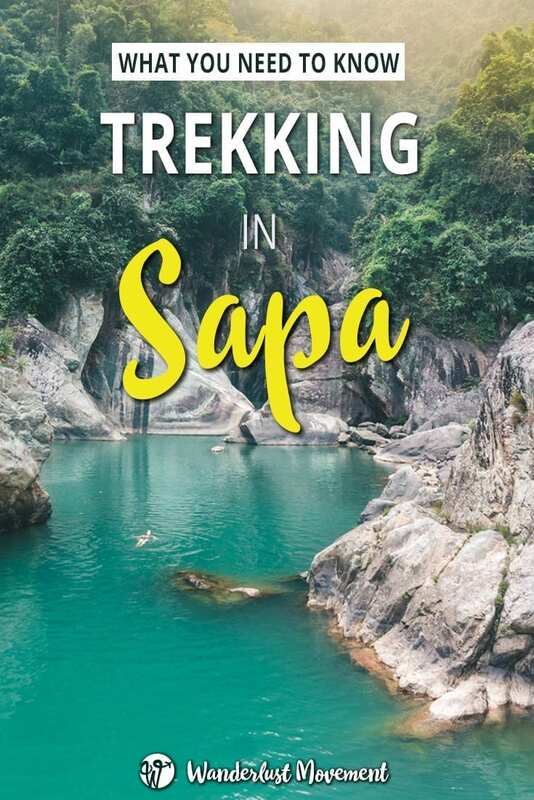 If you want to know about transport costs, how much to budget for a tour, if it’s possible to do a trek solo and what it’s like staying with a local family – here’s everything you need to know about trekking in Sapa, Vietnam! Is Trekking in Sapa Worth it? The easiest way to get to Sapa, if you don’t have a car, is to take a sleeper bus or the train. Located 320 km from Hanoi, there are plenty of service providers that can help you get to and from the city. Instead of returning to Hanoi after trekking in Sapa, you can also arrange a one-way trip to Ha Long Bay, Cat Ba Island or Da Nang. The sleeper train leaves Hanoi around 10:00 p.m. and arrives at the village of Lao Cai by 6:30 a.m. The standard train ticket will cost USD 27 (R352.00) per person each way, and you’ll share a cabin with three other travellers. There are also deluxe options that will include a private cabin, power plugs to charge your devices and complimentary snacks, drinks and amenities. 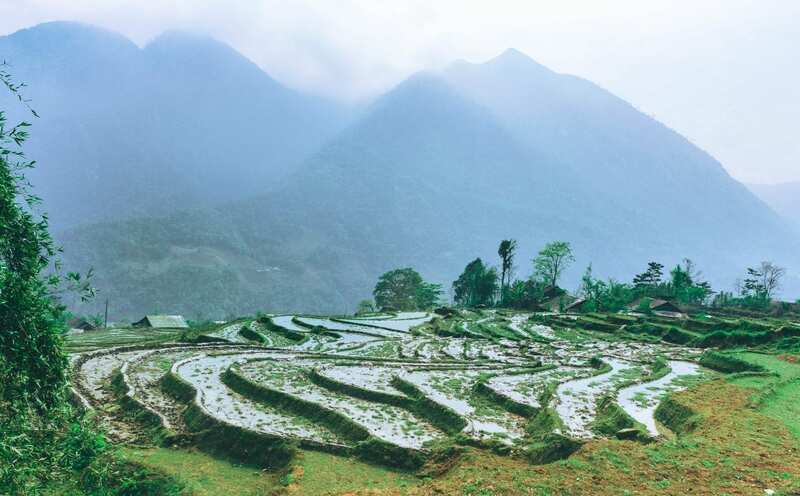 If you haven’t arranged a transfer from Lao Cai to Sapa as part of a tour, you’ll need to take a minibus. It’s a one hour drive, and prices are negotiable. You can expect to pay around VND 40,000 to 50,000 (R23.00 to R28.00), and there are always drivers at the station waiting for arrivals. The sleeper bus from Hanoi to Sapa is a much cheaper option. Tickets cost USD 15 (R196.00) per person each way, and the coaches are quite comfortable. You’re able to lie down, there’s free WiFi, blankets and you get a complimentary bottle of water. The bus does make two pit stops on the way to Sapa. It gives you a chance to use the bathroom and buy some food from the nearby vendors. I took the 6:30 a.m. bus from Hanoi, and arrived in Sapa in the afternoon. Depending on the tour you book, someone might be waiting for you at the bus stop, or you can take a motorcycle taxi to your hostel /hotel. The best time to go trekking in Sapa is between August and November. The rice fields will be at their most photogenic with beautiful shades of green and gold. But it’s also high season in Sapa, so expect more people on the trails, and it will be wise to book your accommodation in advance. If you want to see the rice fields at their greenest, book your trek around June. The only downside is that the rains are frequent and humidity is high. Make sure you have a raincoat, and a waterproof bag to protect your camera gear. I visited Sapa in spring (March to May). The rice terraces were not at their best, but there was tons of farming activity in the fields and blooming flowers. The temperatures were cold in Sapa town, and there was rain the day before my trip. Luckily, the weather was dry for the next three days, but there was a lot of low cloud cover. Winter in Sapa is from December to February. If you sign up for a trekking tour during these months, make sure you bring enough warm layers, as it’s not usual to experience snow during these months. If you’re trekking with a company, you’ll be able to leave any luggage at their offices. For solo travellers, most hostels also offer a luggage hold service. For your trek, you want to keep your daypack light. I used my Freedom of Movement “The Bobby” bag and it held everything I needed for my three-day trek. But the type of bag you bring will also depend on the time of year you visit Sapa. If you’re planning a trip during the rainy season, you’ll want something waterproof. Jacket: No matter what time of year you go to Sapa, you’ll want a warm jacket. The nights can get chilly even in the warmer months. Poncho: Ponchos are reusable, lightweight and won’t take up much space in your daypack. It’s perfect for those unexpected downpours that will keep you and your day pack dry. Trekking shoes: Sneakers won’t cut it for trekking in Sapa. The terrain is quite varied. You’ll be walking through muddy hill slides, traversing over slippery rocks in streams and there’s a lot of steep uphills and downhills. With my trek starting the day after a storm, I almost lost my entire shoe to the thick clay-mud quite a few times. Clothes: For my Sapa trek, I packed three pairs of leggings, three t-shirts and one long sleeved shirt. Even if the weather is warm, you’ll want to cover up as much as possible to avoid sunburn. At such high altitudes, the risk is higher, especially on cloudy days. 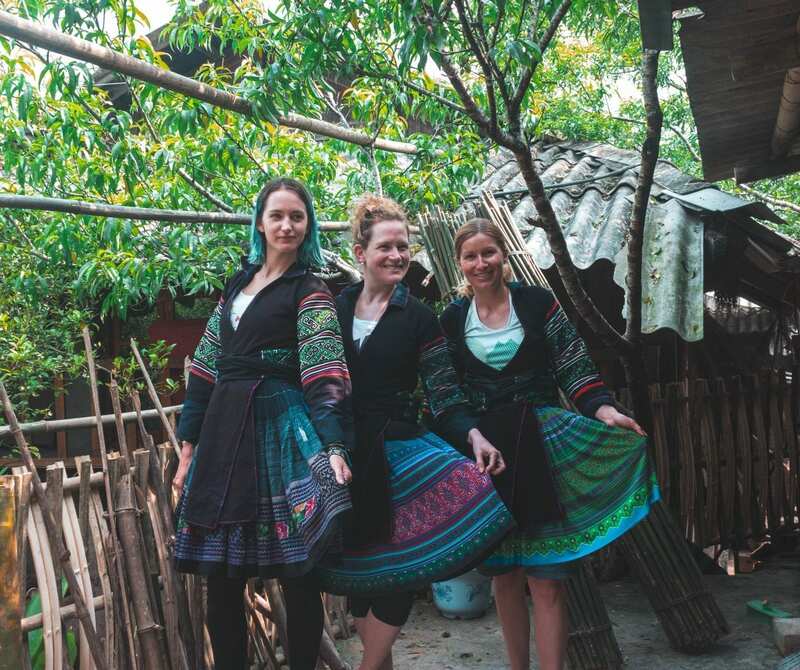 If you’re travelling to Sapa in the colder months, you’ll need to layer up to stay warm, and it will be easier to adjust to the temperature as it changes during the day. Socks: If you don’t have waterproof shoes (like me), you’ll need a couple of pairs of extra socks. Mosquito repellent: I picked up a bottle before leaving Sapa town with my guide. It’s cheap and will keep the mozzies away in the early mornings and evenings. You won’t be able to buy any once you start your trek. Sunscreen: The UX index is high in Sapa, buy a bottle in town or bring some with you from home. Other items: Hat, toothbrush, toothpaste, hairbrush, wet wipes, chargers, camera, cellphone and any medications you might need. You don’t need a guide to go trekking in Sapa. You can base yourself in the town and go one of the many self-guided day hikes from there. If you want to do longer hikes, you’ll need to book accommodation with one of the homestays. It’s possible to range your stay in advance or try your luck in one of the villages along the way. Fansipan Peak is the only hike that requires a guide. It’s a challenging three-day trek, and you’ll need someone with experience to help you navigate the route and the weather conditions. Trekking in Sapa with a guide is the most popular way to explore the region. You can arrange your guide once you arrive in Sapa at the train or bus station when you arrive. But if you don’t want to deal with the hustle of negotiating, you can sign up for a Sapa trekking tour. With only 4-days in Sapa, I choose a Sapa O’Chau trekking tour. I didn’t want to worry about figuring out bus schedules, negotiating rates and finding a place to stay. 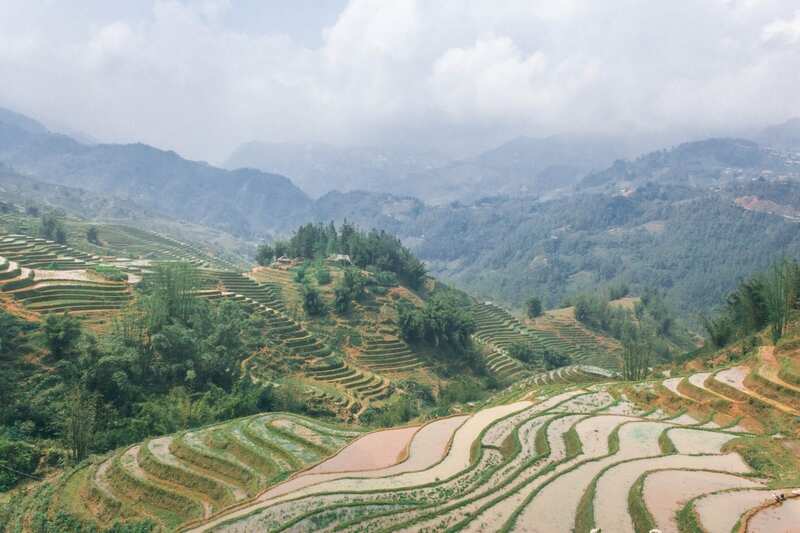 After some research, I decided to book a 3-day hike and two homestays with Sapa O’Chau. 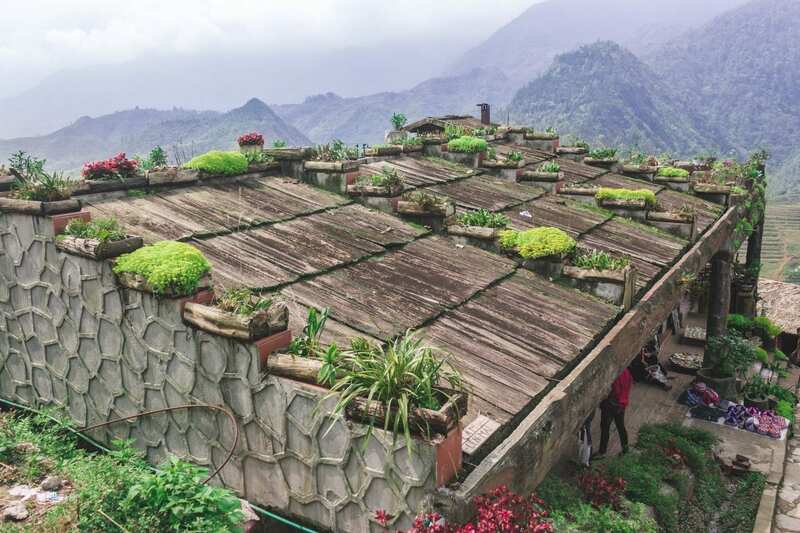 The organisation opened the first Hmong owned homestay in Sapa and won World Responsible Tourism Awards for its socially conscious trekking service. While their prices might be higher than other organisations, I’m passionate about supporting organisations like Sapa O’Chau that have a strong focus on giving back to their community. While at their offices, I didn’t see any international staff and my guide was from one of the local tribes. 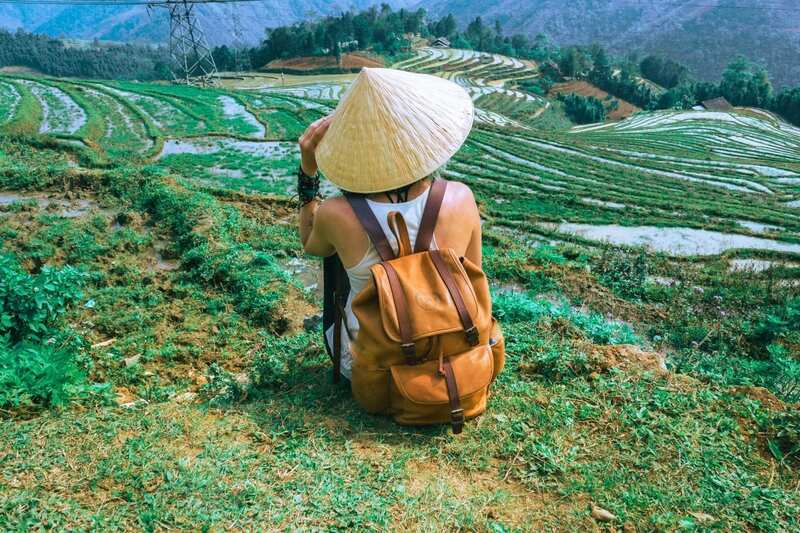 Sapa O’Chau helped him learn English and train him to become an independent guide, so his only career path didn’t have to be working in the rice fields. 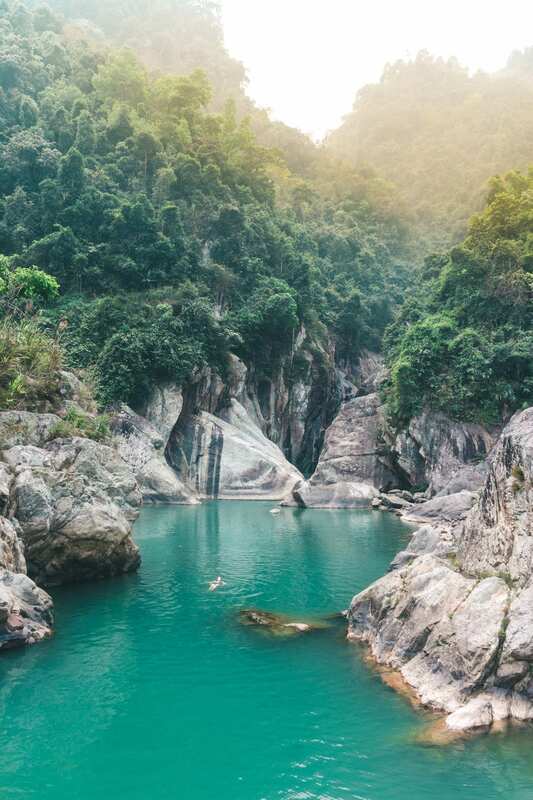 I booked the Muong Hoa Trek. It’s a three-day hike that includes a homestay at two different tribes. The total distance of the hike is 38 km and included stops at the villages of Cat Cat, Y Linh Ho, Lao Chai, Ta Van, Giang Ta Chai, Su Pan, Ban Ho and Nam Toong. 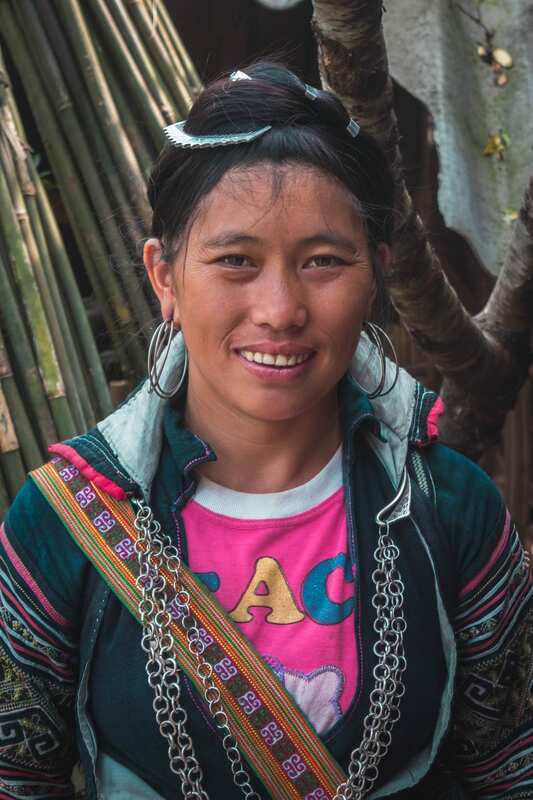 One of the reasons I decided on the Muong Hoa Trek is because it included a stay with Ms Thai Thi May in the Lao Chai Village. Back in 2009, Ms Thao Thi May opened the first homestay run by the Black Hmong minority people in Vietnam. Widowed at an early age with three small children, and her homestay business has allowed her to become financially independent. My stay with her was nothing short of fantastic. Ms Thao Thu May taught me how to make spring rolls from scratch, she made sure there were enough vegan options for me, and she even let us try on some of the traditional Black Hmong tribe clothes. I had an entire room to myself, a heap load of blankets to stay warm, fast WiFi and hot showers. Usually, you will share the homestay with other travellers. As I was travelling in low season, there were only two other girls at Ms Thao Thu May’s house. But at my second homestay with the Red Dao minority, I had the whole place to myself. While it would have been nice to have some company, at least there was no snoring. If you’re a solo traveller like me, Sapa O’Chau can add you to another group doing the same hike, or you can do the whole thing by yourself. Unfortunately, no one was doing the Muong Hoa Trek during my dates, so I had to pay the full price of USD 160 ( R 2,100). If you’re travelling in a group, you can split that cost with up to six people for USD 75 (R 980) per person. The first day of the trek is 14 km. 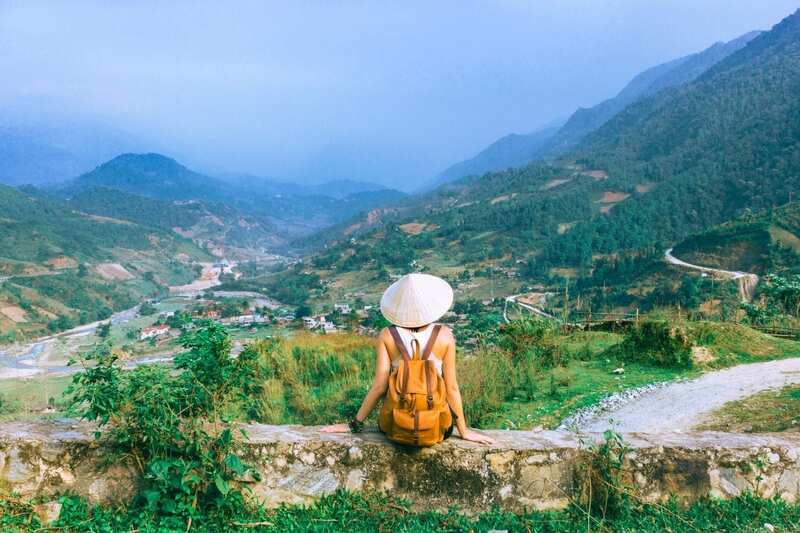 You’ll start off in Sapa town and walk through the village of Cat Cat before you find yourself surrounded by the 100-year-old rice terraces and towering mountains. 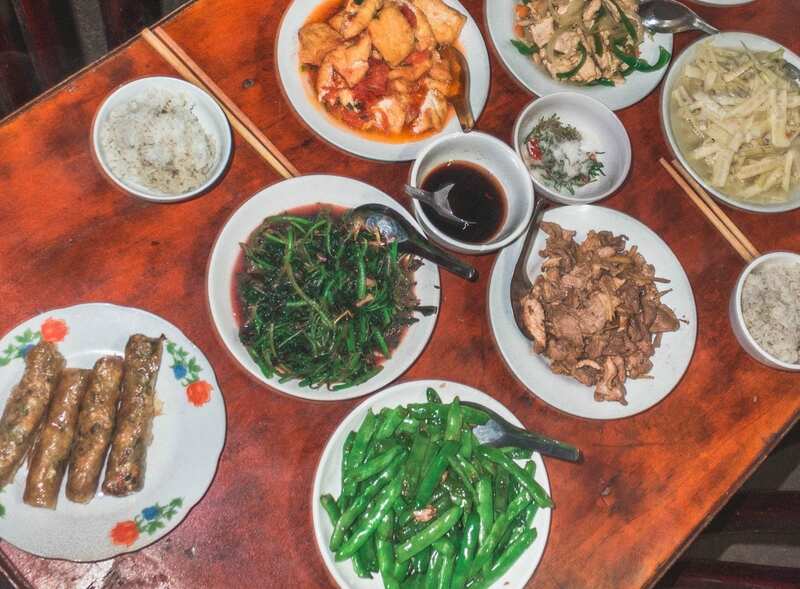 You’ll stop for lunch at a local restaurant in Y Linh Ho before arriving at your final destination for the night. The second day is 16km and the most challenging. There is a lot of uphill, but the stiff hamstrings will be worth it once you make it to the top and see the beautiful vista of the valley below. The trail also leads through a thick bamboo forest that wasn’t the easiest path to traverse due to the thick mud from the rain a few days earlier. The last day is a short 8km. We hiked to a hidden lagoon with a small waterfall, walked through rice terraces at the top of the mountain and made our way back to the homestay for lunch before taking a taxi back to Sapa town. Before we started our trek, my guide warned me about the local women on the way. You might think they are going the same way as you, but they are trying to sell you something. The women will walk with you for kilometres, offer to help you cross the rugged terrain and expect you to buy some of their goods at the end to say thank you. If you don’t plan on buying anything, don’t accept their help and say no thank you. The ladies might still follow you but will eventually give up if you keep refusing their help. A similar thing happens with small children. They often have woven bracelets for sale, but are kept out of school to peddle for children. Instead, buy trinkets from the markets or the shops in the villages and avoid encouraging this behaviour. Breakfast (day 2 & 3), lunch (every day), dinner (day 1 & 2), tour guide, transport (to and from Sapa), homestay fee, and village entrance fees. Drinks, personal travel insurance, tips, drinks at the homestay. While there is no denying Sapa’s popularity on the tourist trail, it’s still an incredible experience. If you’re worried about the crowds, book your trip in the shoulder seasons or opt for one of the more difficult multi-day treks. Lastly, always make sure your impact on the community is responsible. Book your tours with grass-roots organisations, so the locals are directly impacted by the positives of tourism and not just the negative. Want more trip inspiration? Check out my other posts about Vietnam! We live in Napier in the Overberg and are planning a trip to Vietnam in April & May this year. We love your wanderlustmovement blog, which has given us so much info. Can one motorcycle (scooter) between the villages in Sapa – we plan to vist Ta Van and then Ta Phin. Where was the photo taken of the girl (you?) in the water with the mountains in the background – would love to visit. Hi Mark! So glad to hear that you’ve found my Sapa travel guide useful 🙂 I’m pretty sure you can rent a motorcycle in Sapa, I doubt you’d have problems with that. The photo was taken on my three-day trek at the end of the third day. I’m not sure what the place is called as I didn’t get the name from my guide.